Nice pillows for the price , does feel like a hotel. 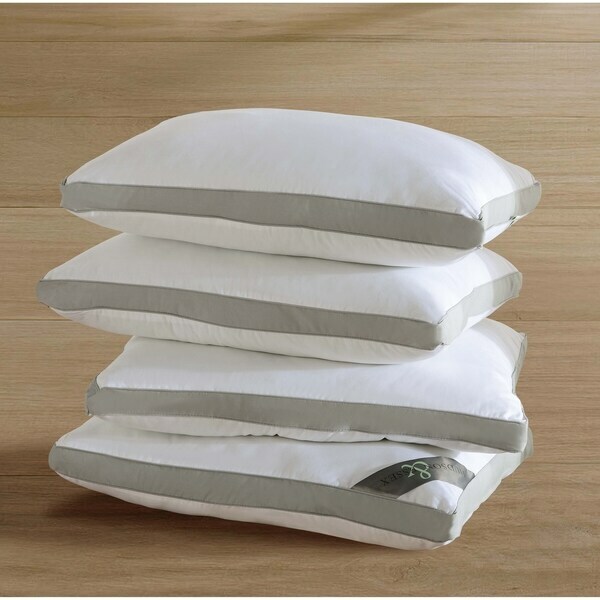 Treat yourself to a blissful night's sleep with the 4-pack Mia Gusseted Sleeping Pillow. Ideal for side sleepers, this pillow features a premium microfiber fill and 2-inch gusset panels along all four sides for added thickness and cushioning to support your head and neck all night long. Available in different sizes. Great pillows, especially for the money! I ordered these pillows not really knowing what to expect as there were no reviews for them yet because they were new to Overstock! My husband and I use these every night and they're comfortable, nice and big (got the King size) and we are really happy with them! These are nice and fluffy! Really pleased with the value of getting four pillows, and they're comfortable. These will not be used much since they're in a spare bedroom, so I have to admit I wasn't really concerned about longevity, although they do fluff back up after sleeping on them. I would definitely buy these again. These are good pillows, you have to like big soft pillows though. I usually like to sleep with two pillows but with these I only need one. They are soft and take up a lot of room. I really love these pillows. My husband is a very picky person when it comes to his pillows. But he like these pillows not too soft and not to firm. I will buy these again for my guess room. I wish they came in king. These pillows are really nice they aren’t to hard and aren’t to soft they are the perfect balance. I would highly recommend them to anyone looking for the perfect in between pillow. Purchased for our cottage. What a great value. Soft but supportive. Not extremely expensive. Fast shipping as usual. Would purchase again in the future. Big soft pillows. Very reasonable price for the set. I ordered some for each member of my family. Wonderful quality and value. Pillows are just the right comfort level. Really, nice. Well priced would recommend if you are on a budget and want good quality, but not too pricey. Well made and comfortable pillow set; a better value than what I could find at Target in at the same price point. Nice pillows, very comfortable. They are firm, but not too firm. The case is very nice and seems like it will hold up.